DAX expressions trickier to write. Cube loading times may suffer. Only similar-grained data can be accommodated. When facts are derived from disparate sources, a monolithic design is not practical. In this case, multiple fact tables can be conformed by presenting a façade of filtering tables. 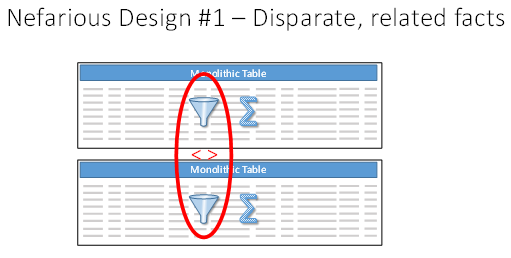 Unlike traditional OLAP dimensions, these table do not need to present surrogate keys – only the union of unique columns values that appear in the joined fact tables. Fact tables perform relatively well. Quickly becomes messy due to all the small filter tables - User experience degraded. The end user experience can, in some cases, be improved by hiding facts behind a chain of filtering tables. When this chain of tables present behavior that is consistent with an end-user’s understanding of the business, the model becomes easier t consume. Such chains usually perform moderately when compared to other virtuous patterns, but can provide an ideal end-user experience. Balance between performance and end user experience. Harder to implement – careful planning needed to figure out how to push each filtering column into just one place upstream of its facts. Is only useful when calculations only rely on one fact table at a time – i.e. where the formula engine can convert the entire expression into an “inner joined” SQL statement. 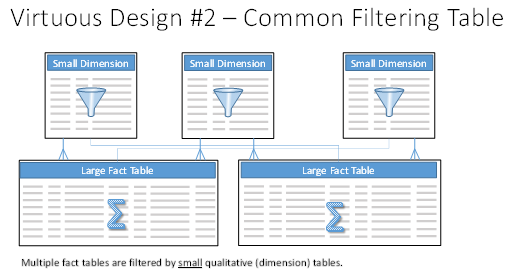 Avoid designs where the same filter(able) columns appear in multiple places. Inevitably, business will ask a question that involve both facts tables. The filter can only be (easily) applied to one table or the other, but not both. Combine (union) the facts into a monolithic table. 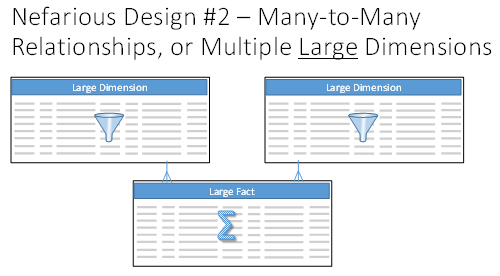 While many-to-many relationships are possible in analysis services, they rarely perform well since they are often bridges between large tables millions of rows. Combine all of the fact tables. Combine two of the fact tables into a child of the remaining table. Patterns that rely on large (>1m rows) tables to facilitate joins between facts perform poorly. Uses the filter to query all keys from the large intermediate table. Passes the keys back to the storage engine to get the first set of facts. Create a third [combined] fact table. Join the fact tables directly to the filtering table. For similar reasons to the “large intermediate table” design, using filtered child tables to filter parent tables can result in lack-lustre performance, stemming from how the formula engine resolves the query. Link the parent table directly to the filtering of the small dimension. Combine the child and parent table.